Discussion in 'Hardware Components and Aftermarket Upgrades' started by tpro, Apr 3, 2016. Intel Stock microcode has a Turbo multiplier bin glitch that allows unlimited multiplier increase, I used prema's bios and removed a cpu microcode update to let the cpu run the stock glitched microcode. Note: steps vary with laptop brand/model, this is intended to share what I did |how it works maybe| with my P150SM. 5) If you have an additional result with type RAW, do the same with the third(in my case) result and save it as a different name other than the first one. 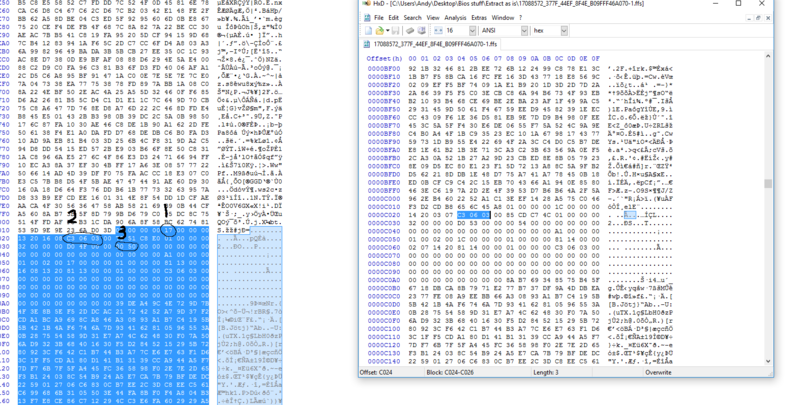 8) (1) Indicates the microcode version, 17 in this case, we want 00 (cpu stock), (2) the platform ID (the search context we reached at) (3) the microcode length = 5000 (in my case) in reverse (important to know when the microcode ends in order to remove later). 13) Double click the third (or whatever your case - if present) result and follow step 12 with the SECOND file you edited in HxD instead. 2) Download the latest beta ThrottleStop, used 810b2. TS 6 does not work. 3) Make sure you don't have XTU installed or running (especially at startup) or it will reset any changes in Throttlestop. 5) Now here is the magic! close FIVR and open it again, [DIALOG] Max value should increase by 2 (up to 80x max ~ 8ghz) everytime you open and close FIVR aslong as long as you increase one of the cores, in my case I have gone with 42x on all cores with 4700mq on stress testing. Seems to be the stable frequency, system uptime is 34 days as of latest post edit, with some Adobe Premier work aswell. My experience/opinion: no real world optimized software puts the same load, at least in personal computing (rendering video, compiling software). Cinebench, aida64 and premier rendering all running at the same time resulted in ~78 watt, prime alone = 100 watt. Get a server if you are going to utilize the entire CPU functions at the same time and as efficiently as possible. I think IBT and P95 are useful for detecting issues with stock settings, (e.g 99% server stability/uptime for data redundancy) Would be happy to be proven wrong as a desktop/laptop user and test as well. Post your results and I'll quote it here. -To add: This mod has been done and discovered by Asus with desktop on haswell launch aswell, though BIOS updates were pushed asap, steps should be similiar with desktop mobos, though there is a decent advantage of applying this on non-extreme mobile due to the insane cost. getting a K processor with desktops is a wiser choice for cheap extra and more thermal headroom. -Intel has done the same mistake again with Skylake this time, would be interesting to see how far 6700HQ can go. Just to clarify, only Throttlestop works with the OC, since in my case, XTU/BIOS does not read the [secret]MSR register, as reading it increments max bin with mc <v6 and set all core clocks to default single core clock with mc v7 with no increment. However TS version 8+ does; aswell as with UEFI/BIOS menus with some desktop motherboards (after mc mod) Asus is an example. Helden57, tiliarou, James D and 4 others like this. @tpro if I put 4712MQ into notebook with no microcode for it, only for 4702MQ, chances are it will behave the same without any need to modify BIOS? jaug1337 and tpro like this. Wow, thank you! I need to try this on my Clevo. I'm stuck at stage 6. Where your 1st highlighted value is '17' mine appears to be '1C' and your third highlighted value is '00 50' mine is '00 54'. Is this correct? Where exactly do I place the cursor and/or start to highlight before I right click>Select Block>Length>5000? Using MSI GT72 with a i7-4720HQ. 00 50 translates to 5000 which is the length, yours is 00 54 which translates to 5400 use that, 1C is the uC version, 2nd value is important if it matches then you are good to go. Though just my opinion, this is not simple guide, its just a thorough non-detailed steps taken to achieve the result, I would advise to not continue modding if you are unsure of the basic stuff to avoid brick.